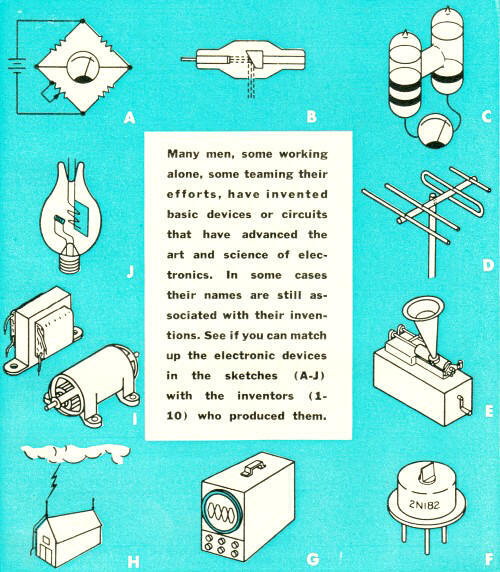 Most of these matches of the devices and its inventor are pretty easy for people who have been around electronics for any length of time (well, not if the length of time is a day or two), but a couple just might stump you. 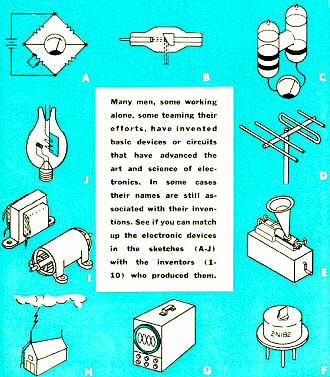 This Electronics Inventors Quiz appeared in a 1963 edition of Popular Electronics, so you won't be challenged with knowing the inventors of the LCD or MEMS devices, but neither will you have to know who came up with the abacus or the Archimedes screw :-). 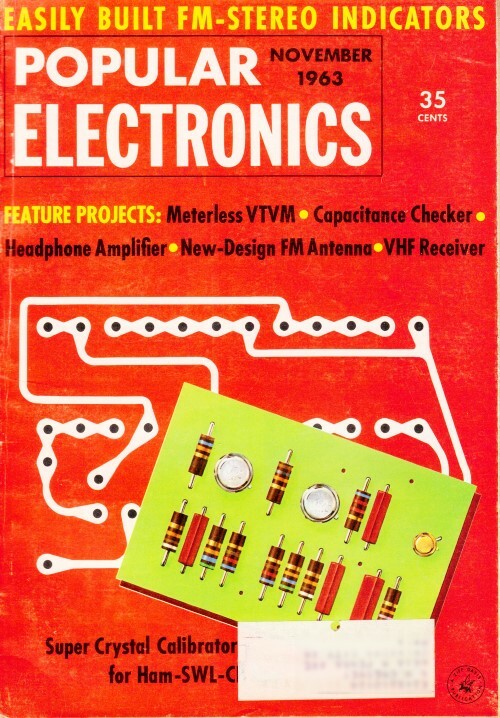 1 - F John Bardeen, Walter H. Brattain, and William B. Shockley invented the point-contact transistor in 1948. 2 - J Lee De Forest invented the grid Audion, the first practical three-element ampli­fier tube, in 1906. 4 - I Michael Faraday discovered the principle of the electric motor in 1821, and of the transformer in 1831. 5 - H Benjamin Franklin invented the lightning rod in 1750. 6 - G Jules A. Lissajous first observed the combination of two waveforms now called "Lissajous figures"
in 1857. The effect is often seen when using the modern oscilloscope. 7 - B Wilhelm K. Roentgen first observed the effects of "Roentgen rays," or X rays, in 1895.
of electromotive force or voltage. was originally devised by Samuel H. Christi in 1833.